I think I can say April has been the craziest, busiest, most fun, and celebratory month of my life! It started with Easter, then Ebie's wedding, then my 29th birthday, then my friend Kelly's bachelorette party in Orange Beach, then my 1 year blogiversary, then my friend Alexa's bachelorette party in Highlands, then my 3 year wedding anniversary, and my dad's birthday. Parker and I stayed home in Southaven this weekend, and it was SO nice to get caught up on life and spend a relaxing weekend with our pups! But anyway, on to my favorites from April! I'm going to share my favorites first, and then I'm going to share my readers' favorites (based on my analytics)! Favorite Dress- My mom got me this dress for my birthday, and I actually wore it to the Florabama on my birthday when we were at the beach for my friend Kelly's bachelorette party! Love the color, ruffles, and tie. I don't always think wrap dresses are super flattering on me, but I do really like the fit of this one! 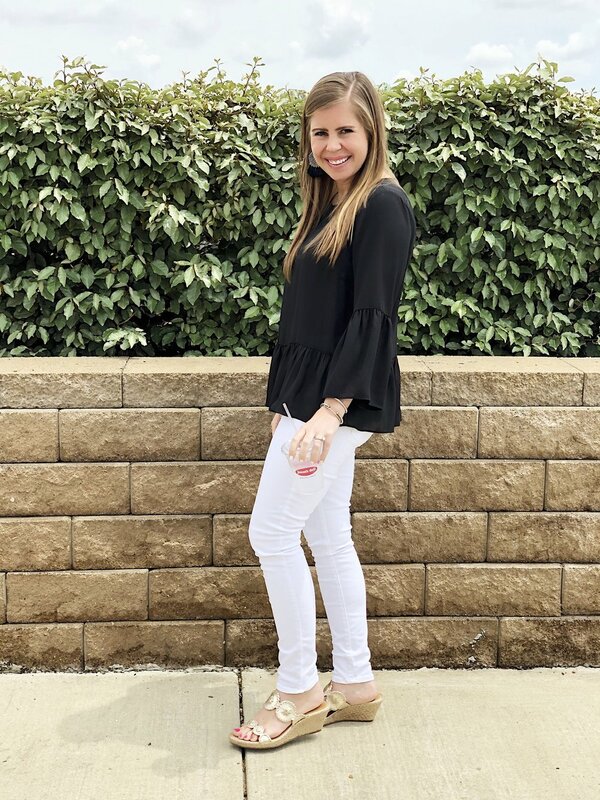 Favorite Top- I've been more of a dress girl this month, but this top is such a great basic to have in the closet. It comes in white, black, and yellow. I love the pretty eyelet! Favorite Shoes 1- My mom gave me these before Ebie's wedding, and I have already gotten so much use out of them. I'm wearing them again this coming weekend for a wedding. They are the perfect heel height and neutral color!